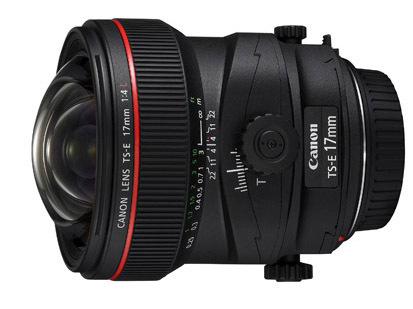 The Canon TS-E 17mm f/4L Tilt-Shift is a special purpose lens that allows one to tilt and to shift the lens to mimic the movements of large format cameras for serious landscape, studio, tabletop, and architectural photography. It was designed with UD glass to compensate for chromatic aberrations and Subwavelength Structure Coating specially designed by Canon to control ghosting and flare. The tilt-shift function on this 17mm f/4 lens allows adjustment of the focal plane by an angle of +/-6.5º and enables parallel shift of the optical axis by +/-12mm. Both tilt and shift can be engaged singly and in combination. The most common use of the shift function is to correct convergence while the tilt function is commonly associated with "miniature" appearing images. You can also use this lens without tilting or shifting as a normal wide angle (but note that there is no autofocus function). This lens works hand-held but for the most precise results it works best on a tripod. Ideally the movements need to be done very carefully for the best results. This lens is ideal for architectural photography, landscapes, and fine art. • This lens is compatible with Canon EF mount cameras in both full frame and crop frame sensors. The focal length equivalent on crop frame sensors is 27.2mm. • This lens is NOT compatible with 2X and 1.4X Canon teleconverters. • This is a tilt-shift lens and does not have any autofocus. This lens can be shot as a standard 17mm wide angle or shifted in any angle desired and remain parallel to the sensor. Tilting allows you to tilt the lens instead of moving the lens around in a flat plane parallel to the sensor. Using tilt makes it so the focus plane of the lens is no longer parallel with the sensor. To see an example of shifting, refer to this post. To see an example of tilting, refer to this post. • There is no filter support on this lens, neither front screw-on type or rear gelatin type.